This article is about the American producer. For the English composer, see Laurence Mark Wythe. Not to be confused with Laurence Marks (disambiguation). Laurence Mark (born ca. 1949) is an Academy Award-nominated, Emmy-nominated, Golden Globe-winning American producer of such acclaimed hit films as Julie & Julia, Dreamgirls, I, Robot, As Good as It Gets and Jerry Maguire. Mr. Mark most recently produced The Greatest Showman, the movie musical starring Hugh Jackman, Zac Efron, Michelle Williams, Zendaya and Rebecca Ferguson, and directed by Michael Gracey which grossed over $425 million worldwide. In North America, it is the highest-grossing, live-action original movie musical of all time and the third highest-grossing live-action musical of all time. Prior to that, Mark has produced Last Vegas, starring Michael Douglas, Robert De Niro, Morgan Freeman and Kevin Kline, and directed by Jon Turteltaub; Flatliners, starring Ellen Page, Diego Luna, Nina Dobrev and directed by Niels Arden Oplev; and Julie & Julia, starring Meryl Streep and Amy Adams and written and directed by Nora Ephron. For television, Mark was an Executive Producer of When We Rise, the critically lauded eight-hour limited series created and written by Dustin Lance Black and starring Guy Pearce, Mary-Louise Parker and Rachel Griffiths which aired earlier this year on ABC. With Bill Condon, Mark served as producer of the highly-regarded Hugh Jackman-hosted 81st Annual Academy Awards which earned him an Emmy nomination. The show itself received ten Emmy nominations and won four of them. Before that, Mark produced Dreamgirls starring Jamie Foxx, Beyonce Knowles and Eddie Murphy and directed by Bill Condon. The movie won three Golden Globe Awards, including one for Best Picture. It also received eight Academy Award nominations, the most of any movie in its year, and won two of them, including one for Jennifer Hudson as Best Supporting Actress. Earlier on, Mark received an Academy Award nomination for producing Best Picture nominee Jerry Maguire, and he executive-produced two other Academy Award nominees for Best Picture, As Good as It Gets and Working Girl. Mark garnered an Emmy nomination and a Golden Globe nomination as Executive Producer of Political Animals, a limited series created by Greg Berlanti and starring Sigourney Weaver which aired in 2012 on the USA Network. The show received four Emmy nominations, winning one for Ellen Burstyn as Best Supporting Actress. He is also an Executive Producer of The Art Of More starring Dennis Quaid, Kate Bosworth, Cary Elwes and Christian Cooke which streaming for two seasons on Sony's Crackle TV. Mark has also produced Romy and Michele's High School Reunion , Last Holiday, and The Lookout, which won the Independent Spirit Award for Best First Feature. In addition to these films, Mark produced Finding Forrester, The Object of My Affection, Anywhere But Here, The Adventures of Huck Finn, Black Widow and Center Stage (plus its two sequels). Laurence Mark Productions is headquartered at Sony Pictures Entertainment where the company has a tong-term production arrangement with Columbia Pictures. Mark's other producing credits include Sister Act 2, True Colors, Bicentennial Man, Simon Birch, Riding in Cars with Boys, How Do You Know and the now legendary Glitter starring Mariah Carey. 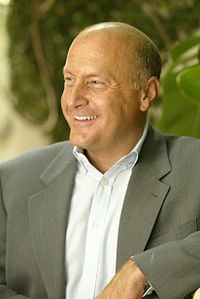 Prior to producing, Mark held several key publicity and marketing posts at Paramount Pictures, culminating in his being appointed Vice President of West Coast Marketing. He then moved into production, and as Vice President of Production at Paramount and Executive Vice President of Production at Twentieth Century Fox, he was closely involved with the development and production of such films as Terms of Endearment, Trading Places, Falling in Love, The Fly and Broadcast News. Mark was born in New York City and educated at Eaglebrook School, The Hotchkiss School, and Wesleyan University, from which he graduated in 1971. He holds a Masters of Arts degree in Film from New York University. He currently resides in Los Angeles and New York. ^ Cieply, Michael (December 31, 2008). "Laurence Mark and Bill Condon Sound the Call to Academy Party Animals". The New York Times. ISSN 0362-4331. Retrieved October 5, 2017.